"L'Eroica, the famous historic Tuscan bike tour known as 'the most handsome bike race in the World' is coming to the UK. L'Eroica Britannia has been named to make iconic British history in the Peak District National Park in June 2014. L'Eroica Britannia happens three weeks before the Grand Départ of The Tour de France 2014 comes to Yorkshire and the Peak District. Hosted over three days L'Eroica Britannia has been confirmed as a three day festival whose pinnacle is celebrated with a three route bike tour of The Peak District National Park on the 22 June 2014. The festival and the ride, known as 'The Great British Adventure' mirror the original Italian ethos which celebrates and values sustainability, territory, environment, heritage, wellbeing and the joys of local food and drink. L'Eroica Britannia has the full support and backing of The Peak District National Authority who are championing L'Eroica Britannia, making the ride and festival the star of their 2014 'Festival of Cycling'. The 3 day event, starting June 20, has brought the World's focus to the area and is welcomed by official tourist board Visit Peak District & Derbyshire. Benefits are expected to be wide reaching to the regional economy, ticking many aspects of the tourism agenda as well as supporting local businesses. David James, Chief Executive. Visit Peak District & Derbyshire comments "L'Eroica Britannia is 'a unique platform to highlight the jewels of the communities en route - whether they be food and drink, historic places or cultural activities." Known as The Great British Adventure, the ride aspect of L'Eroica Britannia embraces the romantic idea of heroic cycling as it once was, adventuring along trails and tracks similar to the historic Tuscan 'Strade Bianchi'. Adventurers may choose either a 30 mile, 50 mile or 100 mile route to be ridden on the 22 June on bikes which comply to L'Eroica rules. Pre 1987 bikes and certain stipulations for apparel must be observed creating a fascinating and vibrant spectacle touring through the Peak District. The ride will be supported by a festival designed to reflect the vibrancy and excitement of The Great British Adventure and will feature innovative and dynamic brands presenting a dynamic and interactive family friendly 3 day event. 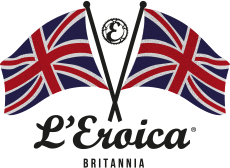 Tim Hubbard from L'Eroica Britannia comments 'we are delighted to present L'Eroica Britannia in the UK. The location of the event was incredibly important to us, one which values and celebrates the joy of the bike and the symbiotic relationship riders enjoy with the British countryside. We feel the Peak District National Park shares our values of championing sustainability and preserving environment as well as celebrating our heritage. We are immensely proud to be bringing this historic event to the UK to create The Great British Adventure and history in the making'." We hope to be at the real thing next year. Wonder how long before one of these events is held in the USA?